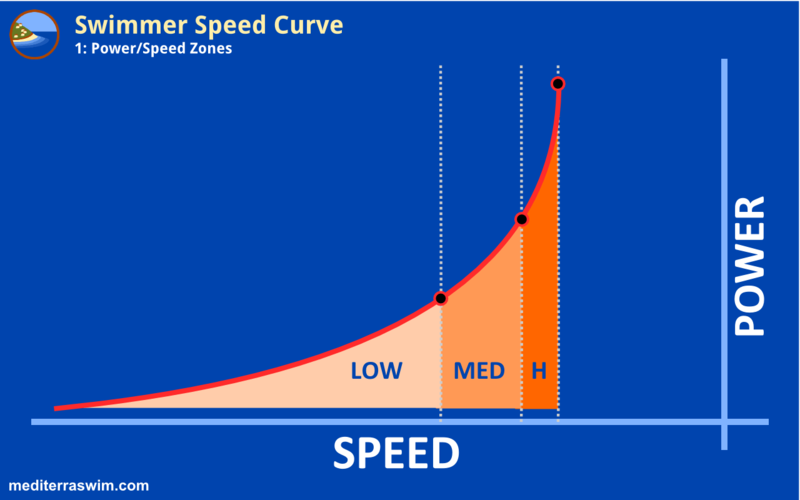 Swimmer Speed Curve – Part 1 | Mediterra - Swim & Run Better Than Ever! I have been working on a presentation to improve understanding of ‘Easy Speed’ and ‘Smart Speed’ concepts in the Total Immersion swimming framework, as I see it. I will break this presentation down into 4 parts. In this diagram we are looking at the speed curve of a swimmer – I intentionally put POWER on the y-axis and SPEED on the x-axis because I like the way that the increasing slope gives the impression of an increasingly difficult mountain to climb as we get near peak speed. We get a visual sense of the diminishing investment-payoff ratio. Otherwise the graph would more appropriately be drawn with speed in the y-axis as the product of power applied, with curves leveling out at their speed limit. Swimmer speed is like the hull speed of a boat, although a boat has a fixed shape and a swimmer has a shape that changes a lot in the act of swimming. So that makes things incredibly complex for measuring human hull speed. Therefore, these diagrams are completely conceptual, not to scale nor reflecting actual data. However, the same basic idea of shape-influences-speed applies. As velocity increases, the resistance of water increases exponentially against boats and human swimmers. So, the faster a swimmer wants to go, the exponentially more power that swimmer is required to generate to overcome water resistance. Just like a boat, there is a point at which the curve goes vertical which means that no additional amount of power will increase the speed of that swimmer. There can be no infinitely big engine to push a boat faster and faster. It is an absolute limit based on the shape of the vessel and nothing but a change of shape can change that curve. And that is the point here – the only thing that can change the position or shape of the curve is the change in the shape of the swimmer. Virtually all human swimmers reach their power-limits far sooner than they reach their shape-changing limits. There are three arbitrary power/speed zones on this diagram. That Node #1 on the curve represents the Easy Speed Limit – this is the limit at which the swimmer’s current body shape will allow him to go with such little effort. This is the zone where one will impress 90% of the other people in the world who really cannot swim at all or who cannot swim without struggle and exhaustion. He will make it look to easy… and it is… once he develops this basic body shaping skill! Then, beyond this, there is power/speed zone that produces respectable speed among his speedy peers in the pool. A swimmer will have to add more power to swim this much faster, even when holding his best shape. He feels a decent result of more speed – but he is going to feel a bit more tired after each practice too because physics requires more energy to make this speed happen. And, then beyond this, past Node #2 there is the power/speed zone that puts a swimmer in the top of his age-group world-wide. A swimmer will have to invest an enormous amount of effort and training to get a very small increase in speed. But done well, that small increase will be enough to push her past her peers. The point here: don’t misunderstand what Easy Speed allows you to do – ‘easy’ is a completely relative word – relative to the struggle and exhaustion you used to experience (and most people still do) before you found superior technique. Physics demands you pay a higher energy price at higher levels of performance, even if you have the absolute most perfect technique in the world. And it gets exponentially more expensive the higher you try to go on that curve. The bad news is that you do still have to work for speed past the Easy Speed zone. The good news is that there are smarter ways of working for it than others and you have access to those smarter ways in Total Immersion. Now, this is raising some good thoughts and questions in some mind out there and I am anticipating many of those because I have heard many of them already among my swimmers – hence, this presentation. Send me your comments if you like, but I may have my response embedded in those follow parts already. Wait until next week! About hull speed and friction you stepped on to a great debate. It’s obvious that subject goes to importance of “vessel shaping” for swimmers. Hull speed of vessel and hull length of vessel has a direct correlation. If a swimmer want to increase speed length of body outside of water must be lengthened on the other hand under water parts should be longer to reduce water friction and increase balance. When we look at a swimmer usually a very nice bow wave is visible in front of a good balanced body. Shape of head is the first part of vessel if you have round head shape bow wave will be larger and also if you have long head it will be narrower. Stroking in to that bow wave and speed of stroke and speed of body is another debate. Very curious about next parts. Thanks, Coach. Hydrodynamics of the hull is more complicated than I understand, I am sure. I use the term ‘hull shape’ in the broadest sense, to include all those details of width, depth, and length, in addition to surface material and shape itself. Human vessels have those same properties. Many may have observed how a boat’s position and angle in the water changes as velocity increases. We know the hull shape does not change, but as drag increases it creates a bow wave and it pushes the front of the boat upward, making the boat travel at an angle. Similar patterns occur in swimmers but at much smaller velocities but bodies are much lighter vessels. So when I use the term ‘shape’ or ‘form’ in the next essays it will refer to all those general features of the vessel in one package. Good article Coach. It serves to illustrate the nature of water resistance, and at the same time point to the fact that initial emphasis should be put to improving hull shape. I would place two lines on the graph, showing two different hypothetical hull shapes, and the potential saving in power available from improved streamlining. A minor correction. The relation between velocity and power is P=K*V^3 (K is a constant), and as such, does not reach a limit. There will always be some speed increase with additional power. I am referring to the concepts of hull speed, and velocity to drag (water resistance) relationship, and how a human will reach a power limit – we might imagine a boat motor of extraordinary (and impractical) size, but we all intuitively know humans have a limit to the motor size (ability to generate more power) and we imagine our current olympic athletes are probably working close to that limit. Therefore, for all practical purposes, the curve must flatten (or go vertical on my graph). Actually, I am inclined to think it would actually curve backward (to the left on my graph) because a human trying to generate more force would so contort his body shape that he would actually go slower and slower at higher and higher power because he essentially stops moving through water and just moves more water around (as Coach Terry puts it). And, you have anticipated the double graph I will present in Part 2!